Gender diversity has quietly come to a group formed after the financial crisis to advise the Securities and Exchange Commission on investor interests. Men held the majority of seats on the SEC’s Investor Advisory Committee at its inaugural meeting in June 2012. Now, women outnumber men, according to a Bloomberg Law analysis of agency records. The panel, created by the Dodd-Frank Act’s post-financial crisis reforms, is made up of about 20 people from fields related to retail and institutional investing. It’s chaired by Anne Sheehan, who until her recent retirement worked at one of the nation’s largest public pension funds. Second in command is Elisse Walter, one of the few women to chair the SEC itself. Other committee members include law school professor and former SEC commissioner nominee Lisa Fairfax and ValueAct Capital partner and general counsel Allison Bennington. Gender diversity isn’t a requirement for the commission’s advisory panels, making women’s newfound majority status on the investor committee particularly significant. Women hold only about a quarter of seats on the SEC’s other advisory panel, which focuses on fixed income markets. Panel members are appointed by the SEC’s chair and other commissioners. The commission’s current chairman, right-leaning independent Jay Clayton, declined to explain how the appointment process works, though he said there’s “a great deal of value” to considering diversity in hiring practices. “Diversity has long been very important to me, long before I got to this job,” Clayton told Bloomberg Law. He said he learned the value of having different viewpoints around the table when he worked in the private sector as a partner at the law firm Sullivan & Cromwell LLP. 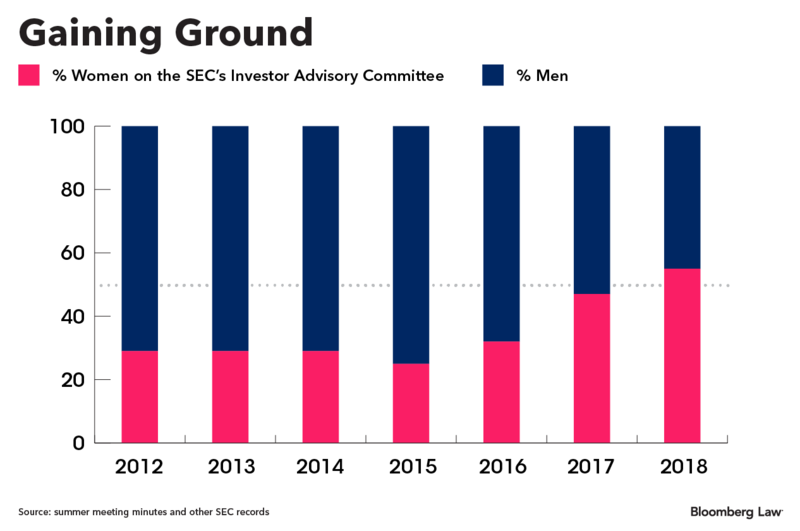 The change in the Investor Advisory Committee’s makeup followed other gains for women at the SEC in the past decade. Mary Schapiro became the first woman appointed as the commission’s permanent chair in 2009, after having previously served as acting chair. Two more women have since chaired the commission, including Walter. Since 2009, the number of men appointed to sit on the commission also has fallen to about half of what it was in the previous decade. Today, 12 of the investor committee’s 22 members are women. Women held half as many spots on the committee when it formed in 2012. The Dodd-Frank Act requires the panel to include the SEC’s investor advocate, representatives of state securities commissions and senior citizens’ interests, along with 10 to 20 people who represent individual or institutional investors or have expertise and experience in investing. Its members have made more than a dozen recommendations to the commission on topics such as broker-dealer fiduciary duty, crowdfunding, and accredited investors. One such recommendation showed up recently in legislation passed by the House. Bloomberg Law reviewed SEC records to determine the committee’s gender makeup around the time of its meetings, which generally happen quarterly. Meeting minutes were Bloomberg Law’s primary source. Old panel rosters saved by Archive.org and other materials from around the time of committee gatherings also were used to determine membership. There was no fanfare when women first claimed the majority of seats on the Investor Advisory Committee at a meeting in October 2017. The milestone went unmentioned, according to a transcript of the gathering. Sheehan, the IAC’s chair and one of its original members, told Bloomberg Law that reaching a female majority happened “organically” and without any lobbying from her. “I think it’s a compliment to the financial services industry and to the fact that the commissioners who have appointed those women recognize the caliber of those individuals and the contributions they can make to the committee,” said Sheehan, who retired this year from her position as director of corporate governance at California State Teachers’ Retirement System. Investing as an industry could also benefit from adding more women, according to former panel chairman Kurt Schacht. He oversees advocacy and ethical standards at the CFA Institute, named after its Chartered Financial Analyst credential for investment professionals. Less than one in five CFA charterholders are women, according to a 2016 report. While most CFA members work in investment management, women are less likely to than men, the institute’s report showed. Women are also more likely to work in supporting or service-related roles than in leadership positions such as chief executive officer, chief investment officer, or chief financial officer. The CFA Institute is running an initiative to boost the number of women in investment management through networking, scholarships, and outreach. Gender diversity on the SEC’s Fixed Income Market Structure Advisory Committee isn’t any better than the industry it represents. The committee, which held its first meeting in January, has more than twice as many men as it does women. Clayton declined to comment on the committee’s makeup. Women are losing ground when it comes to running fixed-income mutual funds in the U.S. even though they’ve outperformed funds run by men since 2003, according to Morningstar Inc. Only 14 such funds were managed exclusively by women as of September 2017, compared with 47 in 2004. The SEC is launching a new small-business advisory committee soon that offers another opportunity to make strides on diversity. A previous iteration of that panel had more men than women before it was disbanded in 2017. “Diversity generally will be very important, and gender diversity will be part of that,” Clayton said.